If you have been a reader of this site for awhile, then you may just remember these guys. I introduced them to you when they were an unsigned band. I decided to review some old articles when these one popped up so I decided to see how they were doing, and it looks like it’s been pretty good for the Black Kids. They have been featured in many media outlets to include, Pitchfork, The New York Times, and USA Today. They have also been signed to Columbia Records since we last mentioned them. Good job. This band from Jacksonville, Flordia consists of Owen Holmes (bass), Kevin Snow (drums), Dawn Watley (keys+vocals), Ali Youngblood (keys+vocals) and Reggie Youngblood (vocals+guitar). The music of Black Kids is often compared with Arcade Fire, Go! Team, and The Cure. 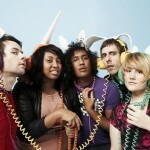 Black Kids toured the United Kingdom in early 2008, including the Vice Live Tour with Friendly Fires and Ipso Facto, a Sons and Daughters tour, and a Kate Nash tour. In April and May, Black Kids toured the United States as an opening act for Cut Copy. The band played the summer festival circuit in the U.S. and the UK, including the Coachella Valley Music and Arts Festival in April, Radio 1’s Big Weekend in May, Glastonbury Festival in June, and T in the Park and Camp Bestival in July. Black Kids then headlined an international tour in the U.S. and Europe from June to November. While in the UK in early 2008 the band recorded their debut album, Partie Traumatic, with producer Bernard Butler, former guitarist of Suede. Their first single, “I’m Not Gonna Teach Your Boyfriend How to Dance with You”, was released in the UK on April 7 and debuted at #11 on the UK Singles Chart. “Hurricane Jane”, the followup single, was released in the UK on June 23, where it charted at #36. The album Partie Traumatic was released on July 7 in the UK on Almost Gold Recordings, debuting at #5, and was released two weeks later in the US on Columbia Records, debuting at #127.